If thre's no mobs inside, interact to crates in the middle of cave. It's to the left of waterfall, lots of neutral animals drinking from pool. Click on Smuggler's Cache inside cave to start event. Captain walks in from outside and summons two non-elite npc's. Down those, and then you can attack and kill the Captain. 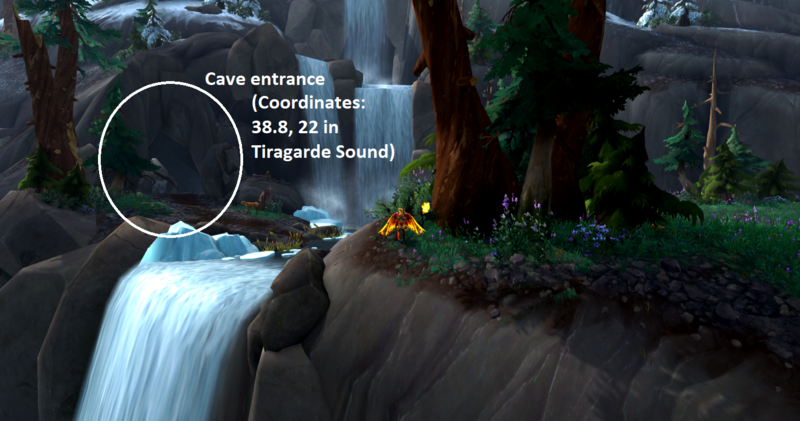 I've included a screenshot of what the cave entrance looks like here; in this screenshot I'm standing at 39.3, 23.0 in Tiragarde Sound, facing slightly northwest toward the cave entrance. For Horde the closest flight path is Waning Glacier, Tiragarde Sound; for Alliance the closest flight path is Outrigger Outpost. As chindok has stated, once inside the cave you need to click the Smuggler's Cache in order to start the event.